1DOWN MC Starring as the GRIM BASTARDS on hit TV show “Sons Of Anarchy” on channel FX. Check out or SOA Blog. From Wikipedia – GRIM BASTARDS -The Grim Bastards Motorcycle Club (GBMC) is a motorcycle club based in Lodi, California whose membership appears to be exclusively African American. Their patch is a laughing skull and a fist, and their colors are orange and black. 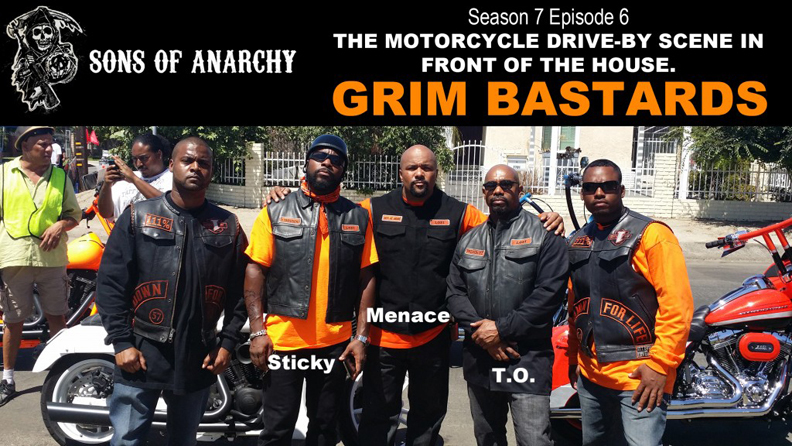 They are played by a “real” MC by the name of 1DOWN MC out of California whom the Grim Bastards are heavily based on, including the same colors and the intentional resemblance of actor Michael Beach’s “T.O.” character to 1DOWN MC President Goldie DeWitt. In addition, the active President of 1DOWN MC plays a Sergeant At Arms of the Grim Bastards going by the name “Menace”, while other members of 1DOWN MC play members of the Grim Bastards. The club is allied with the Sons of Anarchy and an enemy of the Mayans.